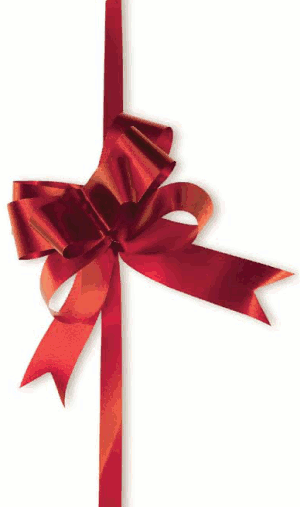 Gift vouchers are now available in the Triskelion shop, as requested. When you buy the vouchers, I’ll send you a pdf certificate with a coupon code on it that can be used on anything in the shop. If you want the certificate either emailed or snail-mailed directly to the recipient, just specify at the checkout (postage is free). When you buy the vouchers, the reward points will go on the buyer’s account, not on the voucher recipient’s account. If you want them transferred to the recipient (i.e. you’re buying for your partner and you don’t knit, etc. ), just add a comment at the checkout. When you buy with a voucher and don’t spend up to the value, you’ll get another coupon code sent to you for any remaining money. In other words, you don’t have to spend the whole of the voucher all at once! Well, the time to get a dedicated workshop has come a bit sooner than I anticipated. The kitchen stove and outside laundry room just aren’t cutting it anymore. Triskelion has grown so quickly over the last six months – I’m spending most of the day going in and out of the house, carrying pots of dye and yarn, and the rest of the day in the garden room (my ‘workroom’), pre- and post-processing it all. Horribly inefficient. So, we’re going have to bite the bullet, gut the garden room, and turn it into a proper dyeing studio. Only to what we can currently afford, but still… five-burner gas hob, double drainer sink plus associated plumbing and drainage, extractor, new worktops, all that good stuff. Rick is a bloody star. He’s doing all the building and plumbing work himself, in between his own stuff, just so I can keep on top of the orders coming in. Some hard budgeting is going to be necessary, and some reuse of stuff we have sitting around in the barn. It’s not going to look like ‘Homes and Gardens’, but it’s going to save me so much work, and enable me to plan my time much more efficiently. I can’t wait. Studio ahoy! After setting out my first unofficial stall in the Triskelion ‘Croeso‘ collection, ideas were coming thick and fast for the next. Given that ‘Croeso‘ was all about vibrant summer colours for me, the natural follow-up would obviously be a collection of colours for autumn and winter. 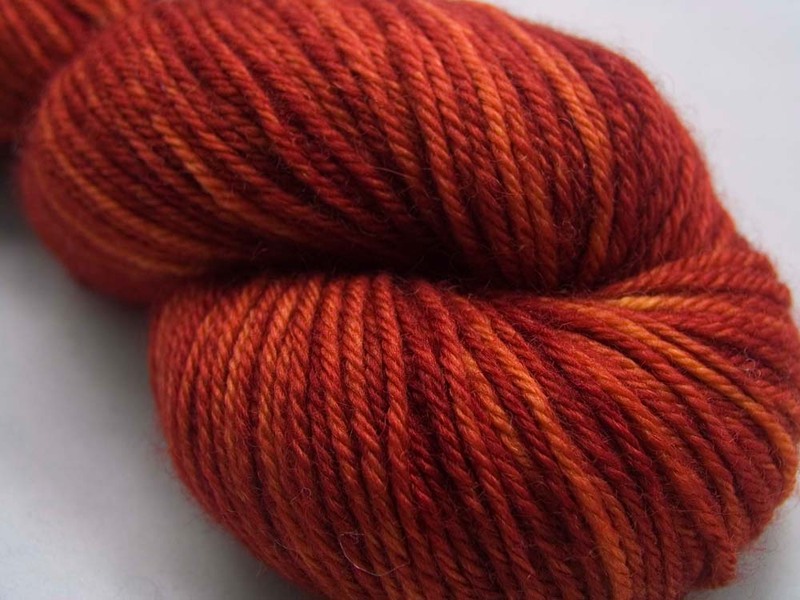 My starting inspiration for the collection was an accident, a misreading of my ‘Red Dragon‘ recipe that resulted in a smouldering yarn of rich, fiery reds, oranges and russets – hearth colours. Once reworked, I decided that the yarn, dubbed ‘Cofgod‘ after the hearth gods of Anglo-Saxon folklore, would become the model and centrepiece of the developing collection – yarns that had the same ’ember’ quality to them. Caramelised colours. Darker, more shadowy, saturated colourways for winter, yet still retaining the Triskelion character. The result is the Triskelion ‘Winternights‘ collection: ‘Sloe‘, darkest blue-violet dusted with frosting; ‘Winternights‘, umbral, inky blue-blacks; ‘Elf King‘, cool Otherworldly grey-blues; ‘Nicor‘, deep water teals; ‘Wodwos‘, bole-shadowed wild green with hints of gold; ‘Beowa‘, aged barley yellows; ‘Cofgod‘, the fiery hob of the hearth; ‘Idisi‘, vibrant dark rose and crimson; and finally, the slumbering dark winter earth of ‘Landwight‘. Nine ’embers of colour’, inspired by the cofgodas, given an Anglo-Saxon articulation and made ready to be knit and crocheted into cosy pullovers and shawls, hats and scarves, mittens and socks. The yarns are all kettle-dyed using resist and multi-glazing techniques to yield highly detailed semi-solids with a superb depth of colour. 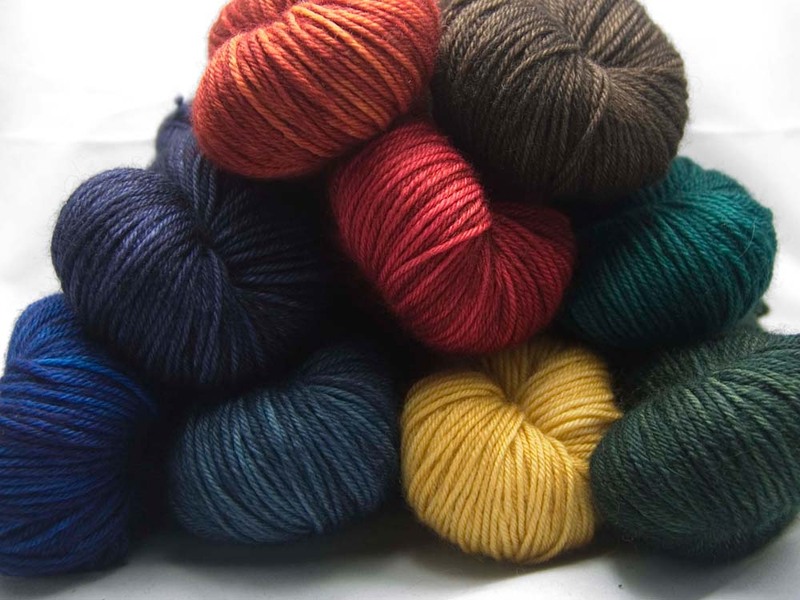 Additionally, the colourways have been developed alongside the Triskelion Neutrals range, so that there are cooler foils for the ‘Winternights‘ embers – ‘Landwight‘ being a shared colourway. Both collections are available immediately in Taliesin DK (shown above), Emrys Aran, Gofannon 4-Ply, and Amaethon 4-Ply. In a week or two, they’ll be followed by Gofannon DK, Rhodri Sock, Emrys Lace, and Ceridwen Lace and 4-Ply. Just in time for Winternights itself! 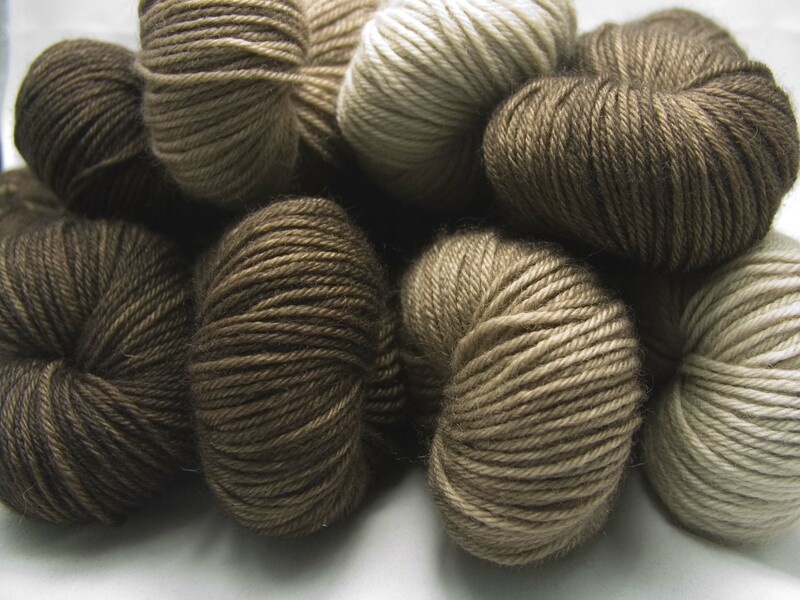 In addition to the forthcoming Triskelion ‘Winternights’ collection, I’m introducing a more formal collection of Triskelion Neutrals that will be available in the full range of yarn bases in the Triskelion portfolio. The initial selection of four greys, three browns, a beige and a rich cream have been carefully formulated to provide complementary foils for the stronger colours of the Triskelion family, with some in particular developed alongside the ‘Winternights’ collection. Additionally, groups of the Neutrals themselves can be used in tonal projects as they’re formulated using identical proportions of the same base pigments. 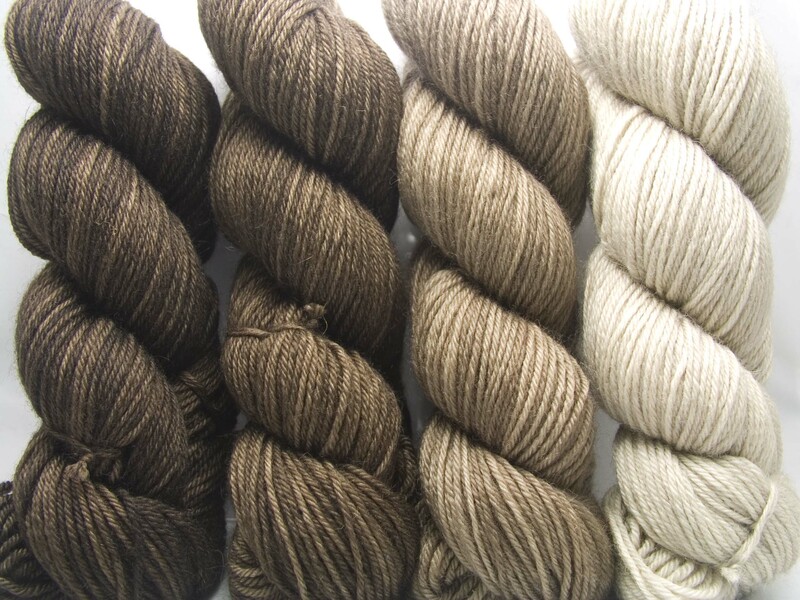 Depending on the yarn base, the Neutrals are all dyed as semi-solids, using techniques that give an elegantly detailed, almost ‘heathered’ look to the yarns. ‘Rime‘ and ‘Anvil‘ join the popular ‘Graphite‘ and ‘Coal‘ to make up the initial selection of greys. ‘Rime‘ and ‘Anvil‘ are brighter, cooler greys, whereas ‘Graphite‘ and ‘Coal‘ are slightly creamier, more complex greys. The browns and beige are neutral in temperature, tending slightly toward the cool side. From light to dark, we have ‘Pebble‘, ‘Woodcut‘, ‘In That Quiet Earth‘ and ‘Landwight‘. 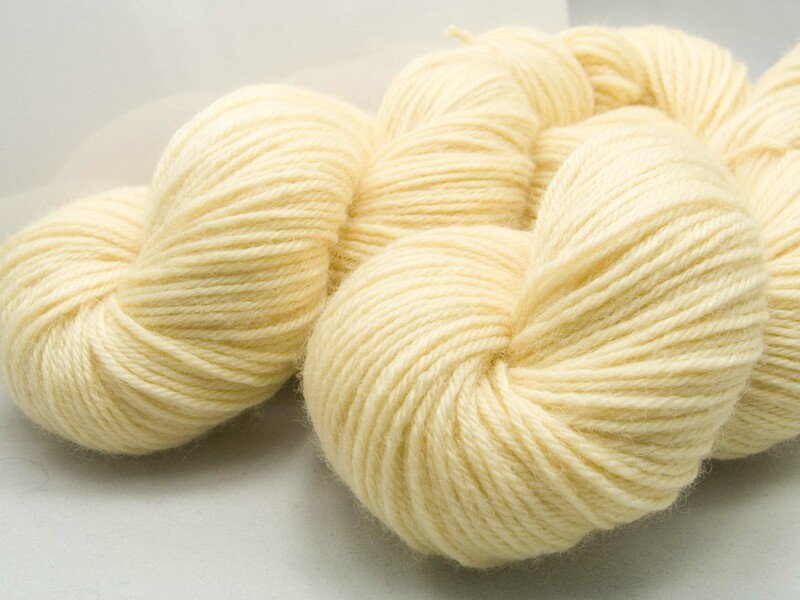 Finally, we have a rich, warm cream – ‘Buttermilk‘ – which is a very slight darkening and enriching of the natural colour of the Blue Faced Leicester used in the Taliesin and Emrys yarns. I hope you can find something to suit you, and more are definitely being planned. 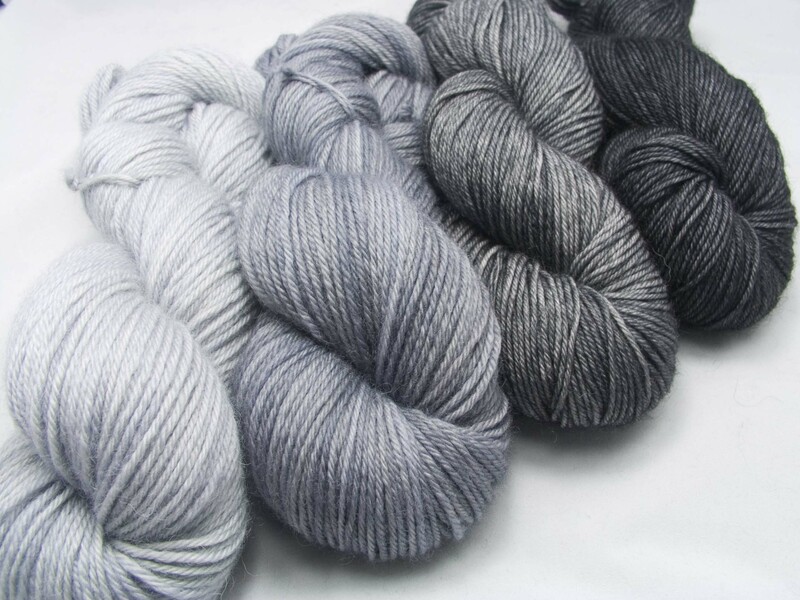 Triskelion greys, in particular, have proven to be very popular, so you can definitely expect more of them. Also, more cooler and warmer browns are on their way in the early New Year. As always, if you have any specific needs or variations on the colours available, just ask.